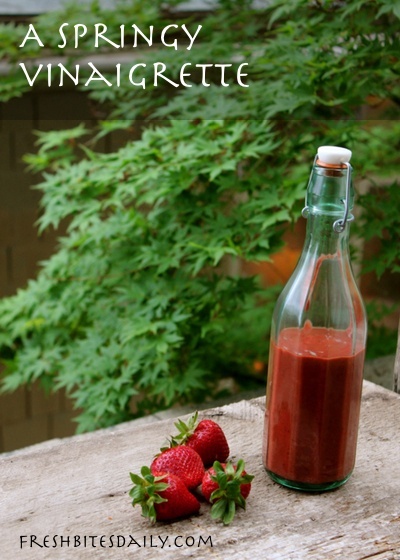 This really ought to be your next salad dressing if you have any access to strawberries at all. I love berry vinaigrettes to start with but it is the roasting of the berry that adds depth to this recipe and, as I say almost daily around the house, “caramelization has never hurt a piece of fruit.” The fruit sugars are up and it shows. 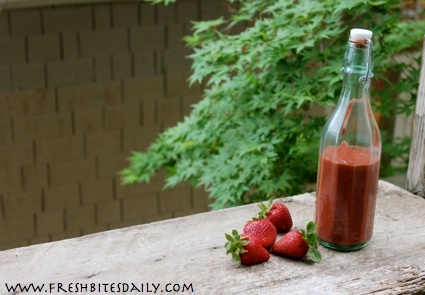 The balsamic vinegar is also an excellent complementary flavor to the strawberries. You start here with roasted strawberries, a process I outlined here. Basically, you roast strawberries in balsamic vinegar and a touch of sugar. This is your base ingredient and is the only part of the recipe that takes time. From there you toss everything in a blend and mix it up. That’s it. Follow the instructions here for roasting strawberries. Roast together the berries, vinegar, and sugar. Add all of the ingredients to a blender and blend well. Olive oil is my oil of choice in this mix but keep in mind that it sets up just a bit when it is refrigerated so this dressing will be very thick to pour right out of the refrigerator. I keep mine in a glass bottle and it is much like the glass ketchup bottles where you have to give them a good pat on the bottom to get anything out. It’s easier if the dressing is at room temperature. Besides using this dressing on your favorite salad, this is an excellent addition to savory dishes, especially heavy meat-centered dishes or extra-spicy vegetarian dishes. Add a bit as a sauce on your dish or spoon a bit on the side, like you would a condiment or dipping sauce.